The major part of Western Sahara has been occupied by Morocco since 1975. Morocco is illegally and brutally occupying the neighbouring country, Western Sahara. While the Sahrawis, the people of Western Sahara, is legitimately struggling for liberty, no state in the world has recognised the Moroccan claims to the territory. Western Sahara is treated by the UN as the last remaining colonial issue in Africa. The Moroccan occupation is in violation of the opinion of the International Court of Justice in The Hague, and in violation of more than 100 UN resolutions that call for the self-determination for the people of Western Sahara. The UN has called for independence and de-colonisation of the former Spanish colony even since the 1960s, when it was still called 'Spanish Sahara', and under Spanish rule. But Spain, at the time a dictatorship under Franco, after heavy pressure from Morocco and Mauritania, denied the Sahrawis their right in the autumn of 1975, and permitted Morocco and Mauritania to invade Western Sahara on 31st of October that year. 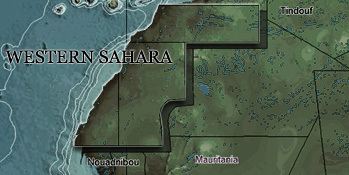 Morocco moved in from the north, Mauritania from the south. The Sahrawis, who were already organised in a liberation movement against the Spaniards, were never asked what they felt about this Spanish deal with the 2 neighbouring states. "Thus the Court has not found legal ties of such a nature as might affect the application of General Assembly resolution 1514 (XV) in the decolonization of Western Sahara and, in particular, of the principle of self-determination through the free and genuine expression of the will of the peoples of the Territory." "The General Assembly[...]Deeply deplores the aggravation of the situation resoluting from the continued occupation of Western Sahara by Morocco and the extension of that occupation to the territory recently evacuated by Mauritania". UN General Assembly 34/37, 1979The occupation took place in a very violent manner. As Moroccan air forces bombed local Western Sahara settlements with napalm bombs, a majority of the indigenous Saharawis were force to leave their homes, and fled to the Algerian desert. Mauritania later withdrew its claim to Western Sahara in 1979 and left for good. Morocco stayed, however. The Saharawi people declared their own Republic in exile, which since has been recognised by more than 80 other states. Yet the world still refuses to uphold international law and bring the occupation to an end. The Saharawi liberation movement, known as the Polisario Front, fought the Moroccan army for 16 years, reclaiming approximately a fifth of their country. In response Morocco built a 1,000-mile long wall, heavily fortified and mined, which divides the Saharawi refugees from those who still live in the Occupied Territories. In 1991 the United Nations brokered a ceasefire and agreed to organise a referendum in which the Saharawi people could vote on the future of Western Sahara. Yet, the Sahrawis are still waiting for the vote to take place. Morocco now refuses a referendum. The Sahrawis' representatives have even accepted that all Moroccans who have been illegally moved into the territory can vote in the referendum. Morocco has denied that too. In stead, Morocco has proposed that Western Sahara be integrated into the Moroccan kingdom. Tens of thousands of Saharawi people still live under Moroccan occupation in Western Sahara. Although Sahrawis have ruled out terrorism as a political tactic, their lives and activities are severely constricted by a harsh security state. The Saharawi flag is banned in Western Sahara, and speaking out for an independent state is illegal. Merely calling for human rights is enough to get organisations closed down and their leaders imprisoned. Yet Saharawis continue to speak out. Over 500 Saharawi are still 'disappeared' in Moroccan custody, possibly surviving as political prisoners. Many have not been heard from for over 30 years. Relatives have been imprisoned and tortured for campaigning to know the truth about their fate. While the Sahrawis are subjected to human rights violations in their home country by a foreign colonial power, the international community looks the other way. Many governments speak with 2 tongues in the issue of Western Sahara. On one hand, they claim to support the UN's efforts to find a solution to the conflict. But on the other, they enter into business deals with Morocco - inside the occupied territory.